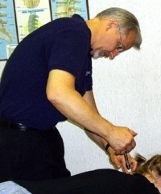 These methods of adjustment do not produce the same "popping" or "cracking" that is associated with other spinal manipulation techniques. Apprehensive patients, and those patients who would rather not hear or feel the effects of spinal manipulation, can also benefit from non-force or low-force adjustments. Dr. Dollinger determines which techniques and procedures would be most beneficial for each patient following an initial examination. In some, but not all cases, x-rays are necessary to fully evaluate and properly treat your condition. Chiropractic treatment may be helpful in treating a variety of health problems, our office specializes in the treatment of neuromuscluoskeletal disorders. These disorders include back pain, neck pain, sciatica (pain radiating down the legs,) numbness/tingling or pain into the arms and legs, headaches, whiplash injuries, sports injuries, and trauma (spine, shoulders, wrists, hips, knees, ankles, and feet,) postural problems and custom made orthotics for foot and ankle disorders are also availabe at our office. If we do not feel that we can successfully treat your condition, we will gladly recommend a consultation with another health care specialist.